Tropical dry forests are among the most threatened vegetation types as a result of human activities, yet relatively few datasets exist that give insight into the long-term impacts of human activity in these diverse biomes, especially in insular systems. In this study we revisited remnant dry forest patches previously surveyed in 1950 and 1970 in the Mokulēʻia Forest Reserve on Oʻahu, Hawaiʻi to assess long-term native woody species’ persistence. Between June 2016 and May 2017 we resurveyed the seven original remnants and found that natives declined in basal area in every plot except one, and maintained basal area dominance over non-natives in only three of seven plots. 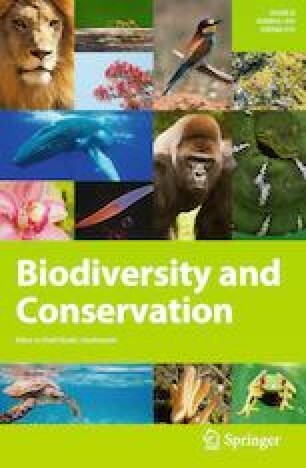 There was a dramatic decline in the richness of native woody species in 2017 (10 species), when compared with observations in 1950 (27 species) and 1970 (32 species). Natives experienced substantial declines in densities, and the greatest reductions in basal area and species richness occurred in plots which previously had the highest native diversity. Only the most common native species were able to maintain their populations, and they are aging. At the same time, non-native woody species richness increased from 1950 (3 species) to 1970 (7 species) to 2017 (13 species). Non-native relative basal area also increased substantially from 1950 (9%) and 1970 (5%), to where it nearly equals native basal area currently (49%). These results indicate that despite there being no obvious change in disturbance levels since these areas were last surveyed, native Hawaiian dry forest remnants are being invaded by nearby non-natives, and will likely continue to decline if not supported by active management. The online version of this article ( https://doi.org/10.1007/s10531-019-01748-1) contains supplementary material, which is available to authorized users. We thank Kristina May for her assistance in the field. We thank the Hawaiʻi Department of Forestry and Wildlife (DOFAW) for permitting access to our research sites, especially Jenna Masters, who was very helpful in arranging access for restricted access roads. We also thank Don Drake, Travis Idol, and Mark Merlin for their feedback which helped us to improve earlier versions of our manuscript. Finally we thank the University of Hawaiʻi at Mānoa Botany Department and the Ecology Evolution and Conservation Biology (EECB) program for their generous financial support in the form of the Charles H. Lamoureux Fellowship in Plant Conservation and the Watson T. Yoshimoto Fellowship in Wildlife Conservation, respectively.